By now, you've likely heard that sitting all day at an office desk is tied to a host of health problems: an increased risk for cancer, heart disease, and obesity, among other conditions. While experts urge people to get standing desks or take sporadic walking breaks, they often overlook another health issue faced by office workers: What staring at a computer screen for prolonged hours does to your eyes. According to the American Optometric Association (AOA), the average American employee spends seven hours a day on the computer, either in the office or working from home. 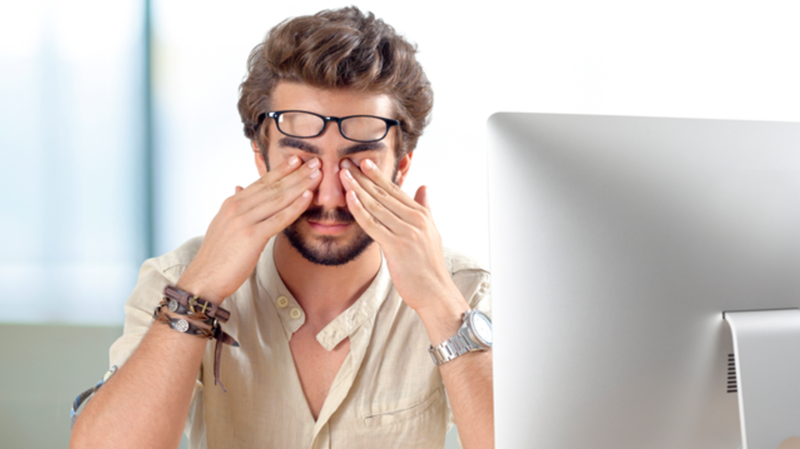 As a result, they’re prone to Computer Vision Syndrome, or Digital Eye Strain, a cluster of eye and vision-related symptoms including eyestrain, headaches, blurred vision, dry eyes, and neck and shoulder pain. To keep your vision in tip-top shape, AOA recommends adhering to the 20-20-20 rule [PDF]: Take a 20-second break to view something 20 feet away every 20 minutes. However, if you’re really concerned about how digital technology is affecting your eyesight, Adweek's GalleyCat blog recently published the below infographic by Framesdirect.com. It provides a slew of additional tips to help you preserve your peepers. When you're finished reading it, make sure to take some time to look at anything but a computer screen.